Steven Ingman was born in 1984 and grew up in the small farming village of Misson in North Nottinghamshire. In 2007 he received a BA degree in Fine Art from the University of Lincoln. In 2008 Ingman was awarded the Derby Open, offering him the opportunity to create new body of work for a solo show. 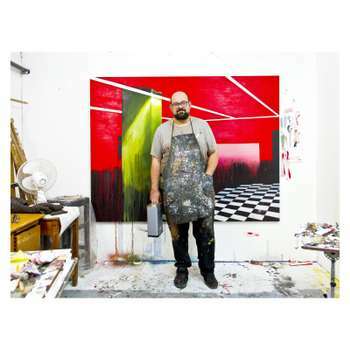 His debut solo show 'Night Light' was funded by Arts Council England and was exhibited in 2010 at Derby Museum and Art Gallery. During the same year he was shortlisted for the Attenborough Award and won the Great Central Solo award, culminating in an exhibit of new works in 2011. He also received the Great Art Award, as part of Nottingham Castles Annual Open 2012. Ingman went on to attained an MA Painting in 2016, while on a scholarship to Wimbledon College of Art, University of the Arts London. His MA end of year show was an almost sellout and in 2016 he was awarded The Young Contemporary Talent Purchase Prize Exhibition in London. Ingman has shown both nationally and international and his work is part of numerous collections including The University of Lincoln, The Ingram Collection and Landmark Plc. Ingman lives in Derby and is based at 3rd Space Studios in Nottingham. As a landscape painter I have always been interested in contemporary spaces and buildings that are in a process of transition and our relationship to them as environments. I consider the use of such spaces and the explore the concept of change; how a space may fall out of or into use. I enjoy the process of trying to understanding an environment and its human interaction by exploring it through an inverted perspective. My work has explored the juxtaposition of night and day, derelict spaces in busy cityscapes, off peak seasons and the natural versus the man made world. Within these settings I delve into the layers of human history, change and narrative. My work allows the viewer an insight into the construction of the painting, with gridded sections and compositional changes often apparent. This reworking parallels the layering and ever-evolving transformation of the subject matter. I am constantly looking for the hidden stories and through the work I produce I aim to reshape the everyday, allowing the viewer to reimagine, question and find new meaning. The Young Contemporary Talent 2016 Purchase Prize. 2016 The Wimbledon Trust Bursary Scholarship Award. 2015/16 The Great Art Award, Nottingham Castle Open. 2012 The Great Central Award. 2010 The Attenborough Prize 2010 (shortlist). 2010 Arts Council England- Grants for the Arts. 2009/10 Derby City Council - Grants for the Arts. 2009/10 Derby Open. 2008 Fresh 08 (Best in show). 2008 University of Lincoln Purchase Prize.